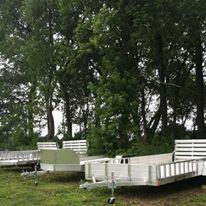 Trailers, trailers & more trailers! 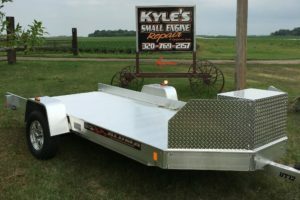 Kyle’s Small Engine offers superior quality trailers from ALUMA that are durable and built to last! Stop by the shop to check out the various trailers in stock. 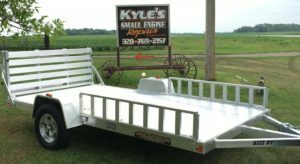 Especially since there are multiple sizes and styles of aluminum trailers from in stock at Kyle’s Small Engine Repair & Equipment Sales! Aluma is the most complete aluminum utility & recreational trailer line in America. 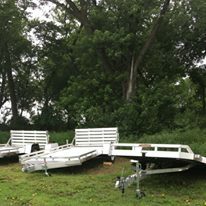 Consequently offering utility, ATV, open and enclosed snowmobile, open and enclosed motorcycle, personal water craft, car haulers and truck beds with headache racks. At Aluma your trailer is formed with all aluminum welded construction – which means no rust! For this reason, an aluminum trailer is lighter than steel. Plus an aluminum trailer is as strong as steel. And finally an aluminum trailer is more durable than steel. Furthermore, Aluma offers a five year all inclusive warranty. 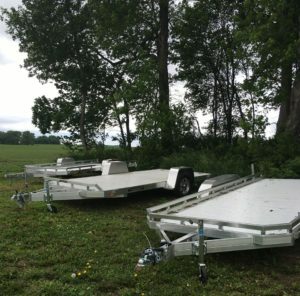 Since 1992, Aluma has been making a quality aluminum trailer to meet your every need. As a result, you can choose from a large variety of open utility trailer options to find the perfect fit for your needs! offers great financing options so you can buy the new trailer you need from Aluma!